The Japan Aerospace Exploration Agency (JAXA) will attempt once again in December to launch the world’s smallest rocket capable of placing a satellite in orbit after their initial attempt failed in January, their SS-520. The rocket, measuring 10 meters long and 50 cm in diameter, will carry a “micro-mini” satellite weighing about 3 kg that was developed by the University of Tokyo to collect imagery of the Earth’s surface. The launch is scheduled for December 25 and will feature the fifth rocket in the SS-520 series. Photo of the January 15 launch of a small SS-520 rocket that had to be aborted when a glitch caused a communications failure. Photo is courtesy of JAXA. 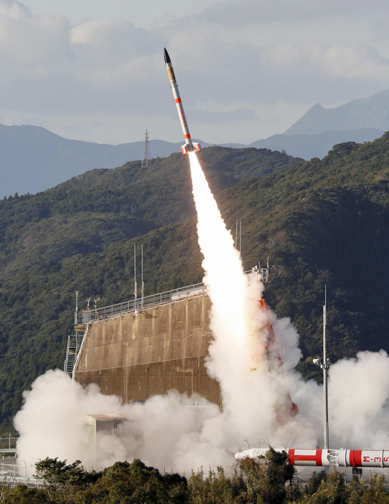 JAXA is hoping small rockets made with commercially available components at low cost will help fuel the growing global demand for smallsats satellites. The agency used components found in home electronics and smartphones for the rocket, which is about the size of a utility pole. The three-stage rocket is scheduled to lift off from the Uchinoura Space Center in Kagoshima Prefecture between 10:00 a.m. and 2:15 p.m.
JAXA launched the No. 4 vehicle on January 15 but was forced to have the rocket plunge into the sea shortly after liftoff due to a communication problem. The agency determined that vibrations during the liftoff caused a short circuit, leading to loss of power at its data transmitter. The agency said it has reinforced protection for electric cables used in the No. 5 vehicle to prevent a short circuit. It has also introduced steps to reduce vibrations during the upcoming liftoff. Article source: The Japan Times.